The client’s primary goal was to create a home that was focused toward outdoor living – including a pool, spa and outdoor kitchen. They were also enamored by simple agrarian structures with some sense of history, as well as an interest in a contemporary aesthetic. 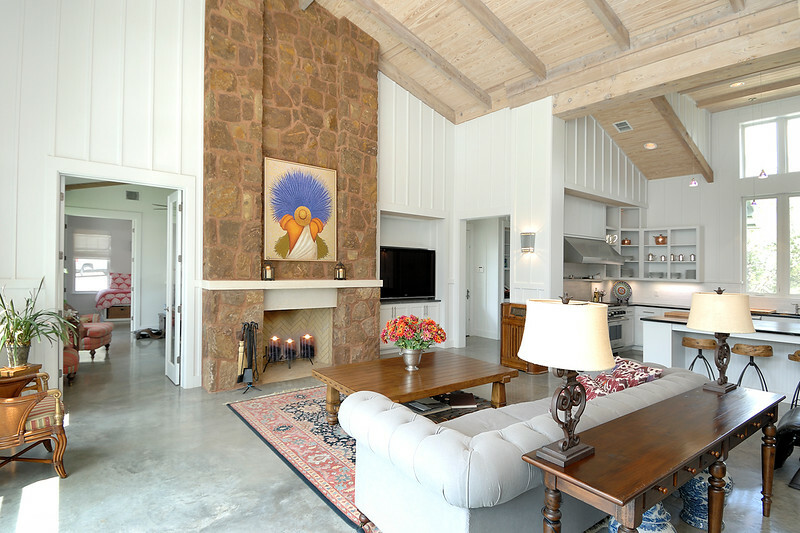 The home is built on a 16 acre property in Wimberley, TX. The building site is on a knoll covered with numerous oak trees, oriented to the east and southeast. The design began with the pool court oriented to the southeast. The house was configured to wrap around the pool on three sides. The house consists of three elements – Great Room building, Master wing and guest/office wing. The Great Room centers on the pool, with large sliding doors opening to the pool court. Hardie Plank board and batten was used extensively on the exterior and interior. Sand stone was selected to provide a deeper tone for the base of the home and at the fireplace. The floors are polished concrete. Exposed pine and fir elements were finished with a pigmented stain.